So instead of a shorts review I did a bit of a video review of the new Pfaff 260. This video took me a LONG time to shoot with many many takes and retakes. It's a simple video but for some reason I was stumbling through it, again, it's hard to pump out creative projects when you have to try this hard. In the end I think it's pretty good. This brings up another point. Some people seem to think I have too many sewing machines. Is this even possible? I obviously love sewing machines for more than just their function and this is a very hard concept to explain to a regular user. being used. So I'm contemplating selling off one or two. The $2 Kenmore is one such example. This is one big ugly machine but man can it sew! It's got a brand new 1.2 amp motor on it which is almost as strong as it gets in the home machine department. There's no embroidery or fancy anything going on here. The feed dogs are nice sharp teeth that will pull anything you got under the foot. Admittedly the only reason I really keep it is because it's the only machine that my high shank Kenmore buttonholer will fit on AND that motor with foot pedal is worth around $50! The other machine I'm considering passing along is the Dressmaker. This is essentially the same machine as the ugly Kenmore but in a much prettier package, in fact many of the parts are totally interchangeable. Cool huh! It has a much weaker motor than the Kenmore but what it lacks in strength it makes up for in beauty. This machine is smooth as silk with very little resistance between the motor and the needle. If you're sewing at full speed and you take your foot of the pedal the machine will continue to sew for quite a few more stitches. The one disadvantage it shares with the Kenmore, they're both left needle machines. This means the needle is fixed in the left needle position. Arguably I prefer this over a fixed center needle machine but at this point I almost require a left, center, right needle position selector. There is a "fancy" Dressmaker 7000 pictured at right that includes an embroidery function that takes cams AND has the needle position selector. It's not quite as pretty but to me it would be much more functional. I think it's because it has more functions that it's not as clean looking. 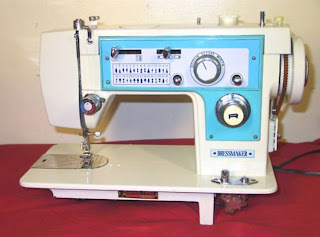 The Dressmaker label was somewhat generic so it's possible this machine was made by a completely different manufacturer. However... I certainly don't need another machine. 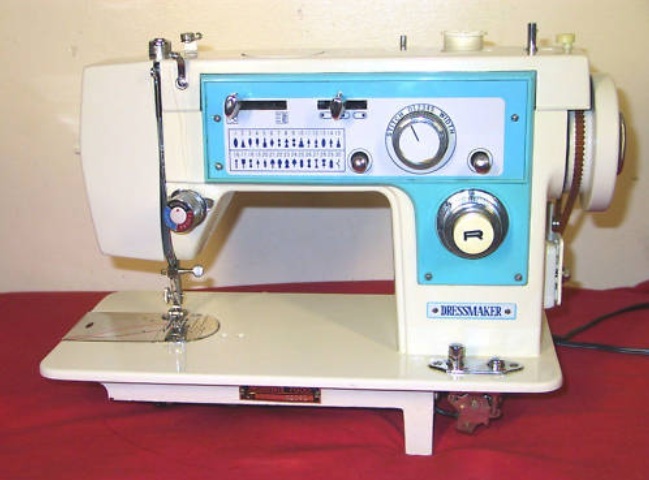 What it comes down to is both the Kenmore and Dressmaker are fine examples of Japanese made machines and I appreciate having at least one of them. Sigh... ok i'll keep them both for now, see how hard this is?